I think the apt. looks so cozy! you do better than me cause I sleep in a ponytail. I pull it back instantly!! I love Kraft magazine too, such good recipes that are easy!! I love your 'coffee table/foot rest/extra seating/' type table thingy...what's it called again? oh dear. getting old...or rather been out of school too long! Do you think you could make the pix a little bigger? it would make seeing the end tables easier ;) i think a nice colorful calm scenery picture would be nice above your couch. even though we're moving in a month, we'll still be in the same cheap building in the scuzzy part of town...but I suppose it could be worse. I am forever grateful that it's spacious at least...and only cheap because of the location and old building issues...but hey the place has had lots of make-up put on, so it doesn't look THAT bad! ha. We've already been here 5 years...and we hope to be here another 5! hehe So yeah, totally understand the feeling. And about he ponytail. GOOD JOB! I am the worst at throwing my hair in a pony tail for the day. I'm also rather jealous tht you and Lindsey get to hang out! OK seems like the place to be! The lamps and table look great...can't wait to see what kind of picture you might find. Your apt looks great! :-) And I love my Kraft magazine -- everything always looks so yummy - and easy to make! Also, where did your get your ottoman thingy (not sure what to call it :)? I am looking for something similar and would love to know where you got yours! 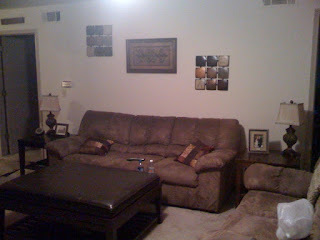 your living room looks great! end tables add so much! totally jealous of your lunch date. someday!!! I've got several recipes from that Kraft magazine on the menu for the next two weeks. Love the end tables and the lamps! I'm looking for lamps too, maybe I'll check Kirkland's out! And I love the end tables! They look fantastic! I'm so glad to have come across your blog! You are too funny and I find myself laughing at your posts because they hit so close to home! Kraft is a huge part of our familie's menu and you can never, ever outgrow mac 'n cheese! I can't wait to introduce it to my little guy! So jealous of your lunch date!! I put my hair in a ponytail at about 8.30 this am. Yea... I fail. I check out Kraft Foods online for recipes, they're pretty easy. I saw a recipe you found on Val's blog, I am definitely trying that meatball sub soon!! 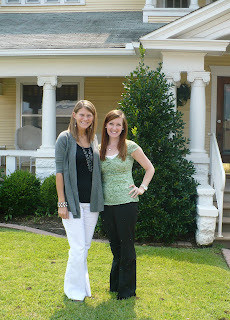 I love doing lunch with bloggy friends! Hopefully I can meet with you soon! The living room looks great!